Entertaining at Easter is all about the long lunch with family and friends, and a garden setting is the perfect way to take the celebration outdoors. Gathering inspiration from nature, we’ve brought a garden-inspired twist to your usual Easter fare. For a truly sensory experience, the garden setting is as important as the table itself. The perfect garden outlook will only add to the atmosphere, so once you’ve found the ideal spot, make the most of your natural surrounds by bringing the outdoor elements into your table setting. Greenery offers a point of difference from your more traditional floral arrangements (… and is often as easy as hand-picking from what already exists in the garden!). We’ve used natural moss to form the perfect base for layering, while hints of native flora add an inherently Australian feel. Keep the look sophisticated and elegant with classic styling, but be sure to include Easter-themed dinnerware and décor for an element of enchantment and whimsy. 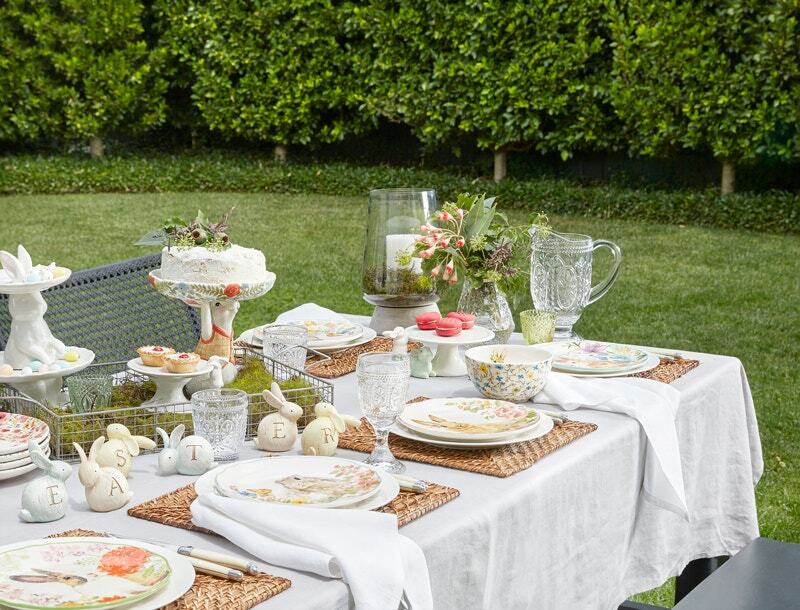 Our Floral and Garden Bunny dining ranges provide the perfect inspiration for the table setting. Adorned with gorgeous bunnies and floral detailing, we’ve used our Bunny Garden Plate as a story-telling feature, placing it against a simple, yet elegant white dinner plate to create height and depth. Our Rattan Placemat adds a natural and textural element, while our Milano linen napery, casually draped, adds a relaxed elegance. Easter themed cake stands in varying styles not only offer a place to store sweet treats, but add enough interest and height to the table setting without becoming the sole focal point. Finally, centrepieces needn’t follow any traditional structure – get inventive and try repurposing your existing décor pieces. A hurricane filled with moss and a candle; tealight candles in complementary tones; and a wire tray filled with moss are all simple, yet creative additions to the table setting. If you’re dining with little ones, the addition of an Easter garland and wooden Easter sign add another touch of whimsy, creating the perfect blend of elegance and Easter delight. Whether you’re welcoming guests young or old, remember Easter is best spent in the company of family and friends. However you choose to celebrate, make it a happy and memorable one!